When telling the story of immunotherapy and cancer and how the two battle it out, it's awfully challenging not to pull out the old A Tale of Two Cities cliché. Because everyone agrees: It is the best of times in cancer research and treatment. Over the past five years, the standard of care for treatment of many cancers has made a decided shift toward marshalling a patient's own immune system to attack the disease. The full spectrum of immunotherapies available are administered at the University of Chicago Medicine Comprehensive Cancer Center. Immunotherapy is available for only some types of cancer. Last year, in an editorial in STAT, two oncologists at Oregon Health & Science University estimated that "two-thirds (68.8 percent) of Americans predicted to die of cancer will die of one that currently has no FDA-approved immunotherapy options." Many patients' immune systems do not respond to treatment. Some patients experience toxic side effects that may end the therapy or be fatal. Advanced clinical trials can fail; UChicago was part of one multinational phase 3 trial that failed this past year. The cost of treatment can be in the hundreds of thousands of dollars, and insurance coverage is not certain. 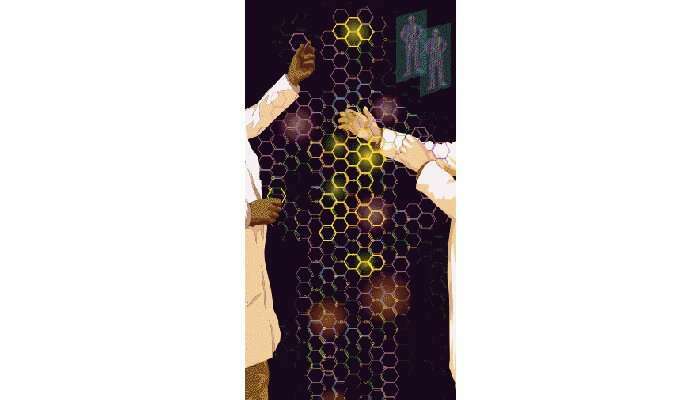 In 2013 Science heralded immunotherapy as the Breakthrough of the Year. By spring 2016 the cover of Time called immunotherapy clinical trials—the main means of access to the therapy—"brutally selective, hugely expensive, lifesaving." The mice have played their parts. A promising immunotherapy has left the lab. Late-stage cancer patients enroll in clinical trials under the watchful eyes of the nation's oncologists. These physicians await whichever therapies will achieve endpoints, gain FDA approval, and help care for their long lists of patients: those whose disease they have barely staved off for years, and those whom the oncologists hope not to need to tell that they have an advanced case and may not have long to live. Chicago, June 4, 2018, in the early morning hours. Two of our main characters are onstage among a group of eight. It's dark, and the crowd is swaying and whooping. "Baby, don't you know it's a damn crying shame?" Buddy Guy—yes, that Buddy Guy—growls into his microphone. To Guy's right, the lead guitarist, an unassuming white man in glasses, jeans, and a maroon polo, grinds out an accompanying riff. The oncological twittersphere lights up. "It's midnight at #ASCO and do you know where some of the world's most famous #immunotherapists are?" comes the tweet from Bernard A. Fox, a cancer immunotherapist and academic researcher from Oregon. It is the end of day three of the annual meeting of the American Society of Clinical Oncology in Chicago, and some of the world's most famous immunotherapists are up on stage with Buddy Guy. The unassuming lead guitarist? 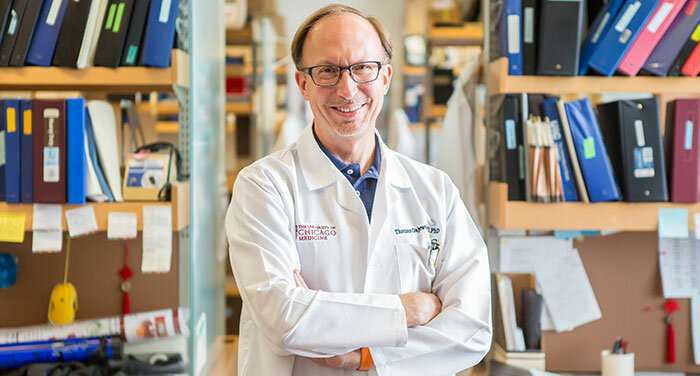 Thomas Gajewski, AB'84, Ph.D.'89, MD'91, the AbbVie Foundation Professor of Cancer Immunotherapy. Gajewski has published more than 200 papers on the basic science of T-cell biology, antitumor immunity, and melanoma therapy—a vast contribution to the development of today's immunotherapy treatments. He is also a clinical researcher, studying patients' responses to cancer therapy. Gajewski received a 2016 Outstanding Investigator Award from the National Cancer Institute at the National Institutes of Health, and he was named a 2017 Giant of Cancer Care by OncLive, the website of the Oncology Specialty Group, a national peer group for oncologists. It was Gajewski's work on T cells in cancer that led Luke to join UChicago in 2014 from the Dana-Farber Cancer Institute and the Harvard Medical School faculty. Luke works with Gajewski to manage clinical trials of novel immunotherapies, including new combinations of drugs, and just opened a phase 3 melanoma trial for stage 2 disease. Gajewski, like Luke, specializes in melanoma, but the trials also seek to bring immunotherapies to patients with other types of cancer tumors. They have built a "bIObank" (bank of ImmunoOncology samples) of patients' tissues, tumor biopsies, and complex blood tests, which are packed with information about patients' immune responses to the therapies—or, most likely, lack thereof. Information from the bIObank feeds back into the basic science research conducted in Gajewski's lab and by other researchers, including those at the Institute for Molecular Engineering. "You know it's a crying shame," Guy sings, bemoaning a two-timing woman while Gajewski's guitar whines. When the immune system detects an antigen—any molecular structure it can identify as foreign—it goes on the attack. 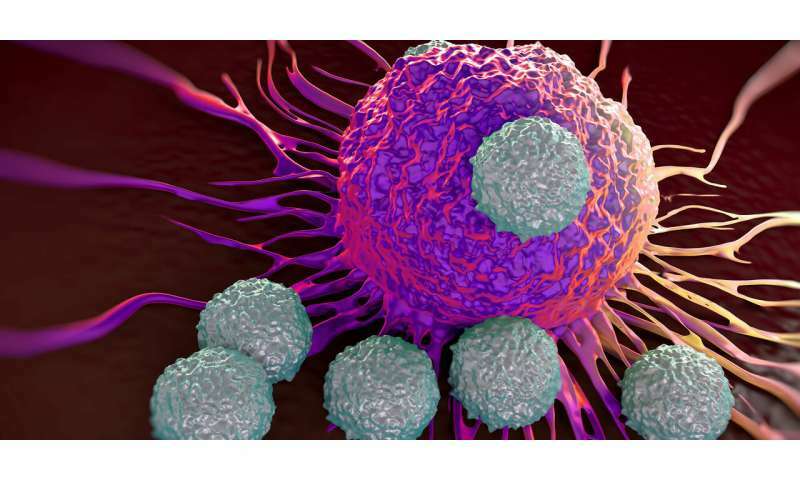 T cells, the white blood cells that drive the body's adaptive immune response, lead the way. But in the complex game of hide-and-seek that occurs within a cancer patient's tumor cells, the cancer can use these very same checkpoints to make the T cells stand down, allowing the cancer cells to mutate and multiply. If unchecked, the tumors may spread, and the cancer could metastasize. In addition to checkpoint inhibitors, other forms of immunotherapy in use include CAR T-cell therapy, a process by which T cells are removed, supercharged, cloned, and reintroduced into the body. (UChicago Medicine was the first site in the country to be certified to treat both adult and pediatric patients with FDA-approved CAR T-cell therapies for specific blood cancers; see "Supercharged," page 34.) There are also cancer vaccines. While these therapies, and combinations of them, are currently FDA approved or in clinical trials available for late-stage patients, in the lab researchers have moved beyond them and are seeking the next wave of immune-boosting treatments. These patients have what's called a "hot," or "T-cell inflamed," tumor microenvironment. Their tumors are populated by T cells that are suppressed but that, if given support by immunotherapies, might fight the cancer cells. But most patients' tumors are "cold," or devoid of T cells, a situation that Gajewski calls a "failure to recruit," making the tumor far less likely to respond to immunotherapy. "We try not to use the c-word," Luke says, referring to the pursuit of a cure, "because we don't want to overpromise what we're talking about, but certainly we have patients who got immunotherapy five years out, 10 years, and longer, with no recurrence and not needing any more treatment. It's sort of like a vaccine, in the fact that if the immune system figures it out, you don't need any more treatment program." To understand why immunotherapy does not work for the majority of patients, researchers must keep going back to the minority for whom it does. Patients who respond to immunotherapy are "paradigm," Luke says. What is it about these patients, their immune systems, their cells, their genes—whatever it might be—that prompts an immune response? One clue could be biomarkers, internal biological molecules whose presence predicts particular clinical outcomes, and for Luke and Gajewski's purposes might indicate which type of immunotherapy would be most effective in an individual cancer patient. Both are among the researchers now working in the lab to understand biomarkers, comparing tissue samples and blood tests of patients who don't respond to immunotherapy with those of responsive patients to understand what's different. Pinpointing biomarkers is the primary focus of a new UChicago clinical trial, begun this past March with Luke as the principal investigator. Examples of biomarkers include oncogenes, genes that under certain circumstances may transform a cell into a cancerous tumor cell. Another biomarker could be the mutation rate within tumors and its effect on how a patient responds to immunotherapy. "Extrinsic" biomarkers include the presence or absence of certain bacteria in a patient's gut microbiome. Gajewski and his team were among the early discoverers of one extrinsic biomarker, a healthy bacteria strain known as Bifidobacterium. In 2015 the team discovered that mice procured for their lab from one supplier tended to have a robust spontaneous immune response to melanoma tumors implanted under the skin. Mice from a different supplier had a much weaker response. When the researchers mixed the mice from both cages together, they found that both sets of mice had a robust response. The team traced the change to Bifidobacterium, which was present in the intestines of the immune-responding mice who shared it with their new neighbors. The anticancer effects of the gut bacteria were comparable to treatment with checkpoint inhibitors. A similar human study from Gajewski's group that transplanted stool samples in patients was "quite compelling," Gajewski told UChicago Medicine's publication Medicine on the Midway last fall. Gajewski worked with the University's Polsky Center for Entrepreneurship and Innovation to file patent applications and the University licensed the technology to Evelo Biosciences, a biotech company in Cambridge, Massachusetts. The next step, Gajewski said in Medicine on the Midway, are microbes "that could boost antitumor immunity in patients." In October 2018 Luke started a clinical trial to assess the effects of the capsule form of an Evelo microbial drug in patients with melanoma. The drug is also being tested in other cancer types. The patent-to-pill path of that bacteria strain is an example of "translational" science, taking research and turning it into drug therapies eventually bound for clinical trials, with FDA approval as the endgame. Gajewski is an inventor on 46 patents and has contributed inventive discoveries to at least four immunotherapies. Three of his patent portfolios are licensed to companies developing immunotherapies, and he's been at work with the University on a start-up company, launching in 2019, that will build immunotherapies based on new discoveries in his lab. In addition, Gajewski worked with scientists at Aduro Biotech to understand how STING agonists (the name stands for "stimulator of interferon genes," a protein complex that helps detect tumor cells and promotes an aggressive antitumor response) can be used to stimulate an immune response. The therapy is now in phase 1 trials. His work to determine that immune-boosting compounds that block an enzyme called indoleamine 2,3-dioxygenase (IDO) can work in combination with checkpoint inhibitors was key to the development of a class of drugs known as IDO inhibitors. But, like any road to discovery, this one is fraught with obstacles: Gajewski's IDO collaborator, the biotech company Incyte, was among three companies to cancel major multinational phase 3 clinical trials of IDO inhibitors this past year. In a May 2018 article, Science magazine called the cancellations a "surprising failure" that "quickly reverberated across the pharmaceutical industry." "That was supposed to be the next big thing in melanoma, and it was just an absolute bust," says Luke. "That really set the field to take a step back, and that was probably a good thing." Another take on the trial result comes from Thelma Tennant, Ph.D.'03, the oncology innovations and ventures lead at Polsky. "Cancer drug development is high risk, high reward," says Tennant, who has worked with Gajewski for more than 10 years to translate his research into patents, licenses, and partnerships that bring drugs to trial. The risk, she says, must be offset by sound planning, from the inception of the idea to the design and implementation of the clinical trial. "Jason and Tom are among many clinician-researchers doing a lot of deep thinking on what happened with Epacadostat" she says, referring to Incyte's canceled IDO inhibitor trial. "One problem was that they didn't have a clear biomarker." "We have a collection of clinical researchers who excel at both clinical research and bench research," Tennant says. "They see what's happening in patients and take it back to the lab and make new discoveries that can rationalize what's happening in the clinic or, better yet, revolutionize the field." Hubbell and Swartz keep a close eye on the published outcomes of immunotherapy, Hubbell says, constantly asking, "Can we improve them?" Autoimmune responses occur because current immunotherapies are systemic, "leaking" into the rest of the body. "With the existing drugs," Hubbell says, "the purpose is to induce immune responses to the tumor, but the side effect is inducing immune responses to the self. They go hand-in-hand. It's very difficult to have one without the other." So Hubbell's group seeks alternatives to systemic treatment. Much of their work takes place in the body's "interstices," the small spaces between cells, particularly in the rapidly changing and unpredictable microenvironment of a tumor. The physiology of a tumor is determined by its own particular mutations, with their own cellular structures, which can affect how the body's fluids flow in and through it. Where tumors present physiological and flow-related "interstitial barriers," Hubbell's group builds nanomaterials for drug delivery. The goal is to make the nanomaterials small enough to penetrate the interstitial barriers, but not so small that they'll get lost in the ebb and flow of bodily fluids. Hubbell also builds nanoplatforms able to deliver drug molecules directly to tumors. Right now the research is in mouse models; the aim is to translate it to the clinic and humans. In these projects, Hubbell works with existing drugs, which he reengineers for higher efficacy and lower toxicity. Why work with existing drugs? Because new drugs present the risk of unknown biological interactions. "If a molecule has already been in use then you know a lot about it," he explains. "You're less likely to be surprised in an untoward way." The inherent "leakiness" of the tumor structure raises the question, "How would I make the drugs stay in the tumor?'" Hubbell says. His group has figured out how to build into the drug molecule an affinity for the extracellular matrix of the tumor. The molecule binds to the matrix, and the drug leaks into the tumor, not into healthy tissues. "We use the tumor as a depot for the drugs," he says. "We can target it and keep [the drug] around for a long time. So an extremely simple idea: The tumor is leaky. That exposes matrix. I can bind to that matrix. That's it. Very simple." Not really simple, of course. The University has patented the intellectual property that goes into reengineering the drugs to add the binding characteristic. It's one of 77 patents on which Hubbell's an inventor. His group is also "trying to take a known molecule that wasn't druggable and turn it into a drug" that might draw an immune response to cold tumors. They look at biological molecules with a known mechanism of action such as cytokines—small proteins involved in the interactions and communications between immune cells—and chemokines, which direct immune cells to sites of inflammation. Hubbell's group is now at work on a tumor-targeting cytokine, as well as classes of chemokines, which only works as a drug "if you can localize them to the tumor," he says. "If you deliver the chemokine in the blood you just induce inflammation everywhere, as opposed to [only] in the tumor." Working with known drugs and molecules significantly shortens the time from conception to clinical testing, Hubbell says, compared to that of a new drug, which is close to a decade. He estimates it takes three to four years "from conception to company founding" for a known drug, then an additional two years to a phase 1 clinical trial. From there to approval "is a long path," he says. "But if it were a totally new target then it might be longer, because there's a lot more toxicology" to do. Tennant, who was the very first Ph.D. student in UChicago's Committee on Cancer Biology, recalls a faculty member saying, "You're that kid in cancer biology. I don't understand why you're studying a disease rather than basic mechanisms of biology." Her reply was that no other disease was as "relevant to biology" as cancer, so in effect, she was doing exactly that. "I've seen this place go from, 'I can't believe you're studying something so applied as a disease,' to faculty starting their own companies," she says. "It's a huge cultural shift." "I try to disabuse my group from the idea that the academic path is the high path, and the industry path is the low path. I think that's a backwards way of thinking," he says. "There's a great deal of glory that comes with implementing. And even in industry there is a tremendous amount of innovation and invention that precedes implementation. I'm just as proud of the trainees who are going into industry as those who are at academic centers." Tennant agrees. "Discovery for the sake of discovery is important but so is discovery for the sake of translation," she says, an effort aimed squarely at enriching human life, as the University motto would have it. "We have to remember that part of our goal is to make discoveries useful in everyday life." The lymphatic system, which Swartz has studied for a decade, is a part of circulation within the body, draining fluid and other items from the body's interstitial space and returning the "cleaned" fluid back to the blood. It is a critical component of the immune system. Immune cells travel through lymphatic vessels and reside in lymph nodes, where they communicate with each other and can become activated. For most of cancer research history, the lymphatic system has been considered one major means of metastasis—a superhighway by which tumors spread to distant sites throughout the body, likely via interstitial flow. "Despite its importance, the regulatory biology of lymphatic function is poorly understood," Swartz's research profile reads. In particular, Swartz wants to understand tumor-associated lymphangiogenesis—the process by which lymphatics expand around and into a tumor. 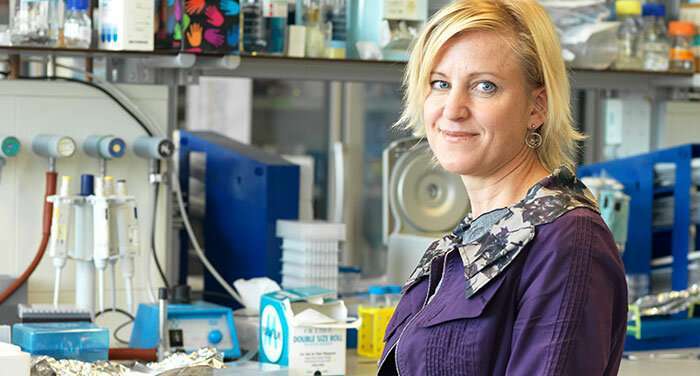 In 2017 she published a surprising twist on the role that the genesis of new lymphatic vessels plays in cancer immunology. "What we realized is not that we were wrong before, but that it's more complex," she says. Initially, Swartz's group set out on a series of mouse studies to understand why lymphangiogenesis promotes immune suppression and allows tumor spreading. But along the way, her group noticed that tumors where lymphangiogenesis occurs were full of T cells. It turns out that lymphatic vessels play on both teams, Swartz says, enabling both damaging metastasis and helpful T-cell infiltration. So lymphangiogenesis is yet another biomarker that may predict immunotherapy success. Circling back to Luke and Gajewski's first subset of patients, whose tumor microenvironments are hot with T-cell infiltration, these are the patients most likely to respond to immunotherapy. Yet these therapies still have problems, says Swartz, who talks quickly, interrupting herself frequently to expand on a previous point and then jump to the next, painting a landscape with a lot going on all at once. Sitting at a round table in her second-floor office, where the high walls of windows show blue sky, Swartz begins reeling off statistics and rapidly working her way through a cartoon—the name researchers give to their schematics of what's happening inside tumors. But she pauses now, and tells about a family friend who lives in Arizona and came to stay with her for three months last fall while participating in a clinical trial. It's an all-too-familiar story, and yet every time it's told, its gravity can dim even the most light-filled room. "At first it looked like it was really great," Swartz says. "She thought she was cured, and then a few months later … tumors everywhere." And then Swartz's lab technician's son, who was only 25 and was receiving checkpoint inhibitor therapy, died of liver toxicity. "This all happened a few months ago. So it's really raw," she says. "There's a lot that's been done, and there's so much promise, and it's so exciting, but there's still so much that doesn't work." This is where engineering can partner with biomedical research, Swartz says, "because we can try to identify where are these problems and make immunotherapies better." Swartz's group is now undertaking studies using Hubbell's matrix-binding structure, where a leaky tumor allows itself to become a drug depot. They load Hubbell's nanoplatform with a high dose of drug molecules—much higher than would be possible with a systemic dose—and target the tumor-draining lymph node. Swartz believes the tumor-draining lymph node is the most "interesting and important" place to target immunotherapies because "it already has information from the tumor." Returning to her cartoon, she maps out the process her group is modeling in the lab with mice: Start with a strong dose of current immunotherapy drugs, reengineered, loaded onto a nanoplatform, and delivered directly to the tumor. The drug wakes up the immune system, and T cells go on attack. But just when the cancer cells begin mutating and fooling the immune system again—which is exactly what happened with Swartz's friend—the adaptive dendritic cells can teach the T cells to respond in kind, in effect learning from the cancer how to fight the cancer. It's executed not in a test tube, but in the body's own lymph nodes. Swartz sits in silence for a moment, savoring the thought. Truly, it is both the best and worst of times in cancer research. At UChicago Medicine, Gajewski, Luke, and their colleagues will go about caring for patients in the most recent round of clinical trials, watchful, hopeful, adding valuable samples to their bIObank to feed into future research. And at IME, the mice will play their roles, the research will be framed toward translation into its own clinical trials with humans. And then we will see about the times to come.